If the skill you selected was within your players’ capabilities and you have done an effective job of introducing, demonstrating, and explaining it, your players should be ready to attempt the skill. 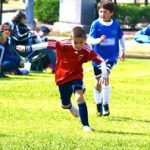 Some players, especially those in younger age groups, may need to be physically guided through the movements during their first few attempts. Walking unsure athletes through the skill in this way will help them gain confidence to perform the skill on their own. Your teaching duties, though, don’t end when all your athletes have demonstrated that they understand how to perform a skill. In fact, your teaching role is just beginning as you help your players improve their skills. A significant part of your teaching consists of closely observing the hit-and-miss trial performances of your players. You will shape players’ skills by detecting errors and correcting them using positive feedback. Keep in mind that your positive feedback will have a great influence on your players’ motivation to practice and improve their performances. Remember, too, that some players may need individual instruction. So set aside a time before, during, or after practice to give individual help. After you have successfully taught your players the fundamentals of a skill, your focus will be on helping them improve it. Players learn skills and improve them at different rates, so don’t get frustrated if progress seems slow. Instead, help them improve by shaping their skills and detecting and correcting errors. One of your principal teaching duties is to reward positive effort and behavior—in terms of successful skill execution—when you see it. If a player makes a good hit in practice/ immediately say, “That’s the way to drive through it! Good follow-through!” This, plus a smile and a thumbs-up gesture, goes a long way toward reinforcing that technique in that player. However, sometimes you may have a long dry spell before you see correct techniques to reinforce. It’s difficult to reward players when they don’t execute skills correctly. How can you shape their skills if this is the case? Shaping skills takes practice on your players’ part and patience on yours. Expect your players to make errors. Telling the player who made the good hit that she did a good job doesn’t ensure that she’ll have the same success next time. Seeing inconsistency in your players technique can be frustrating. Its even more challenging to stay positive when your athletes repeatedly perform a skill incorrectly or have a lack of enthusiasm for learning. It can certainly be frustrating to see athletes who seemingly don’t heed your advice and continue to make the same mistakes. It is normal to get frustrated sometimes when teaching skills. Nevertheless, part of successful coaching is controlling this frustration.